Sign up today and make a £10 deposit and get a £10 Free Bet. You can use your £10 Free Bet to bet on all your favourite sports. 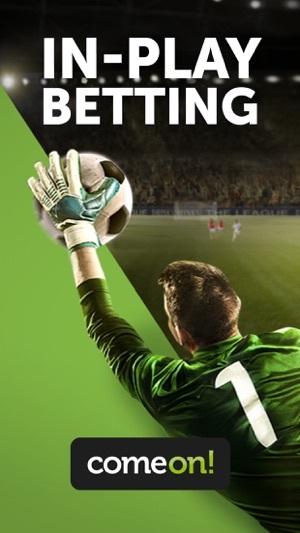 We offer the latest live betting odds and in-play bets on all major football games, tennis matches, horse racing, basketball and much, much more. ComeOn! has all the sports action you want, 24/7! Whatever you want to bet on, you will find the best live & pre-match betting odds from all around the world at ComeOn! ComeOn! Download the ComeOn! Sports Betting app and get involved in the action. •	Get a £10 Free Bet with your first deposit at ComeOn! •	ComeOn! Free Bet Club - get Free Bets every week! Just place multiples bets on any sports event during the week. The more bets you place the higher Free Bet reward you win. Love football? 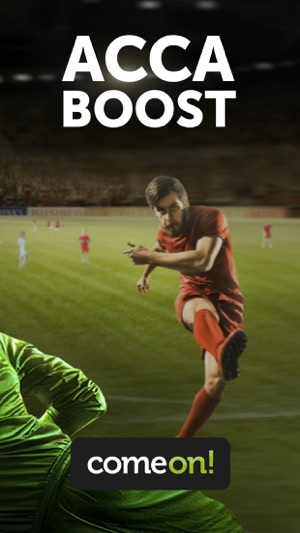 Bet on your favourite Premier League teams, both pre-match and in-play, with live odds on across all of the English, Scottish, Welsh and Irish leagues, as well as other major European football leagues like Spain's La Liga, Italy's Serie A and Germany's Bundesliga. Love tennis? ComeOn! offer great live tennis odds from Grand Slam events to ITF qualifying tour matches. 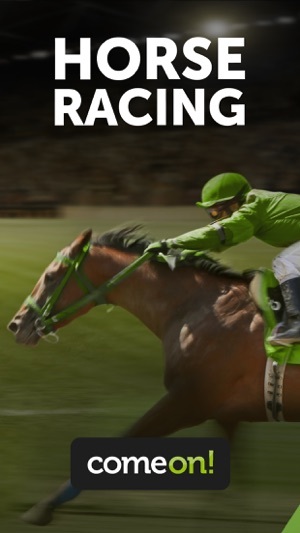 Whether you are a novice punter, first time race goer, or a seasoned expert ComeOn! has all the latest results, scores, tables, statistics and form guides for a range of sports. 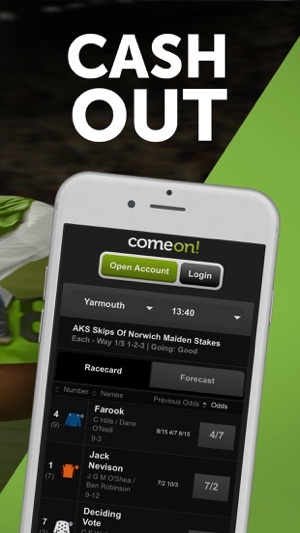 If you love a day at the races, make your horse racing bets using only a few simple taps at ComeOn! Today. Placing a bet with ComeOn! couldn't be simpler. Once you've found the market you want and are happy with the price, click on the odds and your selection will appear in your betting slip. Enter your stake and your potential winnings will be displayed. Click on Place Bets and your wager will be confirmed. Already one of our amazing customers? Just download the ComeOn! app, sign in and look out for our regular daily and weekly offers! So, ComeOn! what are you waiting for? Place your bets! Sign up free today for the best odds on in-play betting on all your favourite sports like football, tennis, horse racing, golf and many more. ComeOn! Casino and Sportsbook is operated by Co-Gaming Ltd and is licensed and regulated by the UK Gambling Commission. All ComeOn! 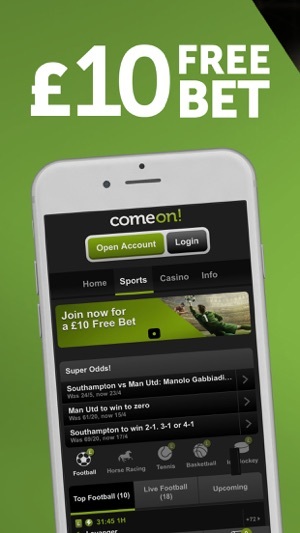 Casino and Sports app users must be 18 or over and register an account with ComeOn! before placing real money bets. Gambling can be addictive, please play responsibly. Poor app, works with Apple Pay sporadically. Doesn’t store password in keychain or any Touch ID login. Constantly crashes so can never tell if it is poor WiFi or the app itself. A real shame as good quality offers. Show you will have 3x£10 free bet , when you’re new customer . They only give you 1 . Live chat said they can’t do anything. Worst app for betting on, trying to view my current bets but keeps kicking me out have to keep clicking on it for at least 10 attempts for it to load, won come cash and now I have to prove my identity with driver licence or some proof of address and when I do try to load up my picture from my phone of said ID I keeps saying it’s too big to upload. The cash out option has to be worst I have ever dealt with soon as a match kicks off I can never view the bet in cash out anymore. Also I use fractional not decimal when betting and when I do change it when I log I keeps changing back to decimal. Hint this isn’t so European country this is the UK we use fractional. This all needs to change or they’ll lose a lot of customers for a very poor app.